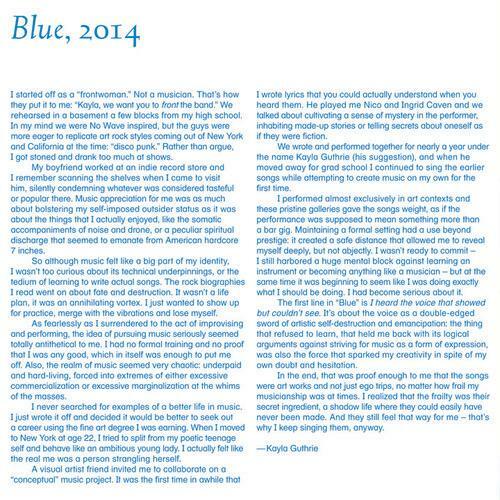 "Blue" is Kayla Guthrie's first solo musical release, a collection of songs culled from her repertoire as a solo performer dating back to 2009. Developing a style that foregrounds her voice and surreal yet personal lyrics arranged over simple digitally composed instrumentation, Guthrie's music is inspired by expressive, ritualistic hybrids of word, song, and/or performance. A 4-song EP crafted from the raw materials of Guthrie’s live backing tracks, "Blue" was mixed with new vocal recordings in the home studio of engineer Grady Owens over the period of one year.